Embarrassingly, the signal Doug has been having trouble with at that corner is none other than WBEZ’s and, it turns out, he’s not the only listener experiencing trouble near that area. For the record, we didn’t know the signal in question was ours until we started finding an answer for Doug, but it turns out that the physics that keep FM radio humming — and create problems — are shared by public, commercial, and educational broadcasters alike. And, the exercise of tracking down a cause is a reminder that the technology we care about is not always associated with the Internet. WBEZ engineer Peter Femal points out that if radio broadcasting technology never existed today and people heard it was possible to “build a signal that covers millions of people 50 to 100 miles from one single point,” the response would likely be exuberant. But maybe radio’s overall reliability is partly responsible for its mystery. To straighten things out for Doug, we spoke with broadcast engineers about the obstacles radio signals encounter in cities. Here, we showcase a few common culprits. Because radio is usually so reliable, the causes of bad reception can seem mysterious. The only exception, maybe, is distance, which is the most common cause. Unlike the Internet, which is connected world-wide, radio broadcasts are limited to the signal coverage of their local transmitters and antennas. You probably know this from road trips, which add miles between your car’s receiver and your favorite hometown radio station; the farther you travel, the weaker the signal gets and the more static you hear. Turn up your volume and drag in the graphic above (or open a full-size window) to experience the effect of distance on radio reception. As you get further from a station’s broadcast location, the signal will weaken, and you will hear static. If another station is broadcasting on the same frequency in another city, you might begin to pick up their signal as you get close to that city. Note: Interactive graphic works best with Google Chrome or Safari. However Doug’s problem area at Van Buren and Canal Street is less than two miles away from WBEZ’s broadcast tower at the John Hancock Center. In Doug’s case, there are more complex issues than distance at work. The simplest, city-based radio problem is called shadowing, which is basically a fancy term for a big building getting in the way. “If you’re in the right shadow of a certain building, our signal might have a hard time coming down into that valley,” WBEZ engineer Peter Femal says. In Doug’s case, there’s a mass of skyscrapers between his particular downtown corner and the transmitter at the John Hancock Center. With so many buildings between the Hancock Center and Van Buren & Canal, the shadowing phenomenon means that WBEZ’s signal is off to a rough start, and that’s before we factor in multipath interference. Multipath interference is a bizarre phenomenon, in that it occurs when a radio signal interferes with itself. When a radio station broadcasts a signal, that signal propagates throughout the city, reflecting off of many of the buildings. Even if a signal has a direct path from your radio to the broadcast tower, that signal is also bouncing off the buildings around you. Sometimes a bounced signal and the direct signal hit your antenna together, but the reflected signal travels farther and is a bit delayed. John Boehm, a broadcast engineer for Clear Channel, says that sometimes, the delayed signal will be stronger than the direct one. The delay between signal paths results in interference. Doug’s trouble spot lies in what you might consider an urban canyon; the corner’s next to the Chicago River, which is lined with skyscrapers on either side. Radio signals can bounce back and forth from building to building in this canyon, creating prime conditions for multipath interference. Turn up your volume and drag around the graphic above (or open a full-size window) to experience the effect of shadowing and multipath on radio reception. Shadowing occurs when a building or other obstruction gets between your radio and the signal source. Multipath results when signals reflected off of buildings interfere with the direct signal. Note: Interactive graphic works best with Google Chrome or Safari. Under these circumstances, Femal says, car radios can get confused. If the radio station that you’re trying to listen to has weak reception, some radios will look for the next most powerful signal, even if it is from a completely different radio station on another frequency. The resulting effect can sound like the ghost of another radio station haunting the one you are tuned to. 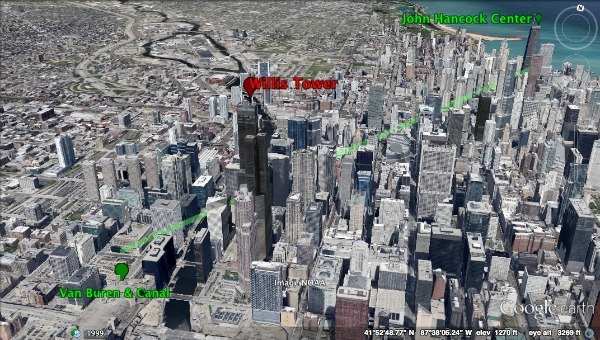 Many high-powered radio stations broadcast from the Willis Tower’s antennas, which is right next to Doug’s corner. The tower’s radio signals give a confused car radio lots of other options. During a test conducted in a car parked at Doug’s corner, a WBEZ engineer and I could hear Queen’s “Crazy Little Thing Called Love” coming in from a music station — even when the radio was clearly tuned for WBEZ’s signal. So unfortunately, at the corner of Van Buren and Canal street, it seems like static is coming from all of the above: shadowing from downtown skyscrapers, multipath interference occurring within an urban canyon along the Chicago River, and other radio stations from the Willis Tower’s broadcast antennas. With all those issues, unfortunately, there’s not much that can be done to improve reception at that corner. But, in this day and age, many of us have the option of enjoying our favorite radio programs delivered static free, via podcast. Curious City, ahem, is just one of many available in iTunes and Feedburner. Mickey Capper is a Curious City Intern. Follow him @fmcapper.